I always have to Google the name of this restaurant on Leicester Square in London. I would like to suggest renaming the restaurant Mermaid's Tale or simply Mermaid. First of all, all the signs for the restaurant are grammatically incorrect. There should be a possessive apostrophe between the D and S; and second, I find Mermaids Tail a bit vulgar or at least open to vulgarity. Or maybe it's just my dirty mind. Mermaid's Tale sounds more Disney. Possibly vulgar name notwithstanding, I gave Mermaid(')s Tail a tug last time I was in London. 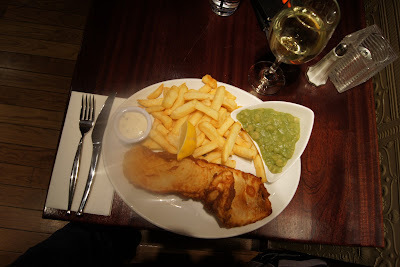 I wanted to try their gluten-free fish and chips--my first fish and chips after six years of eating a gluten-free diet. My first impression of the restaurant was shaky. In preparation for the 2012 Olympic Games, Leicester Square has been under construction for months. Despite the deafening construction noise, several guests were eating at the eight or ten tables outside the restaurant. It was a sunny day, but I chose to eat inside--where it was a lot quieter. The interior is a classic, upscale British pub. Lots of wood. The menu--with steaks, ribs, fish and chips and a few vegetarian options--caters for conservative tastes. Which is fine. I like a good honest plate of food as much as I love a sophisticated one. In the end, Mermaid(')s Tail occupies an important space on Leicester Square: a British atmosphere with sort of British food. I was greeted warmly. In fact, friendly service was the restaurant's strongest suit. How much would you usually pay for fish and chips? How much would you pay if you had waited six years to do it? At Mermaid(')s Tail, fish and chips will set you back around 16 pounds. That's one piece of fish, chips and mushy peas. London is expensive, but 16 pounds for fish and chips is exorbitant. Still, I was on a mission. 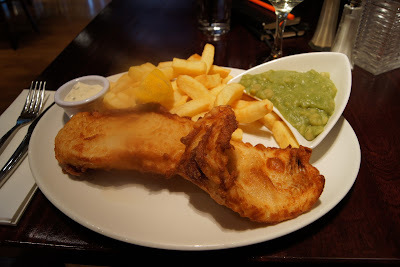 People with Celiac Disease in the UK like cider, and I really would have liked to drink a cider with my fish and chips. Mermaid(')s Tail doesn't offer cider. They must be the only restaurant with a bar in the UK who doesn't offer cider. I had wine for 7 pounds a glass. The best part of the meal was the mushy peas. They were tasty. The fish was bland and the chips were, well, chips. I suppose it's the type of food you would eat when you're really hungry, maybe starving. The batter on the fish was completely tasteless. When I asked my server what kind of gluten-free flour they use to make the gluten-free batter, she had to ask the cook. The cook relayed the message that they buy a mix, which wasn't my question, but it answered other questions. Even if you buy a gluten-free batter mix, you can still add pepper and salt--something to add flavor to a very blah affair. Is Mermaid(')s Tail worth a visit? Certainly not for their gluten-free fish and chips. If you love fish and chips and you have Celiac Disease, you'll be disappointed by the taste; if you only mildly like fish and chips and have Celiac Disease, you'll be disappointed by the price. The restaurant is definitely worth a visit if you want friendly service in a traditional atmosphere on Leicester Square. They're also running a special right now, so you could save a few pounds on dinner. Wait, there was more gluten-free madness at the weekend. 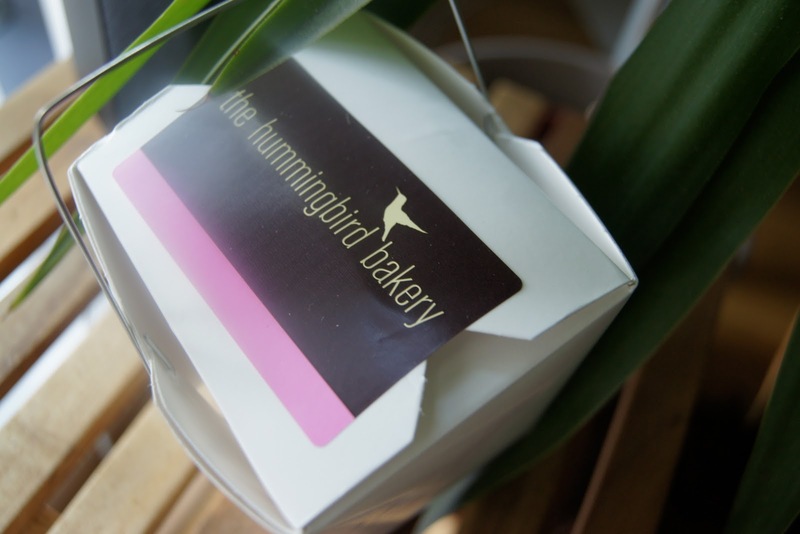 As I was walking home from the gym, I passed The Hummingbird Bakery. Actually I went into it before I passed it just to see if they offered anything gluten-free. They did. Almost. 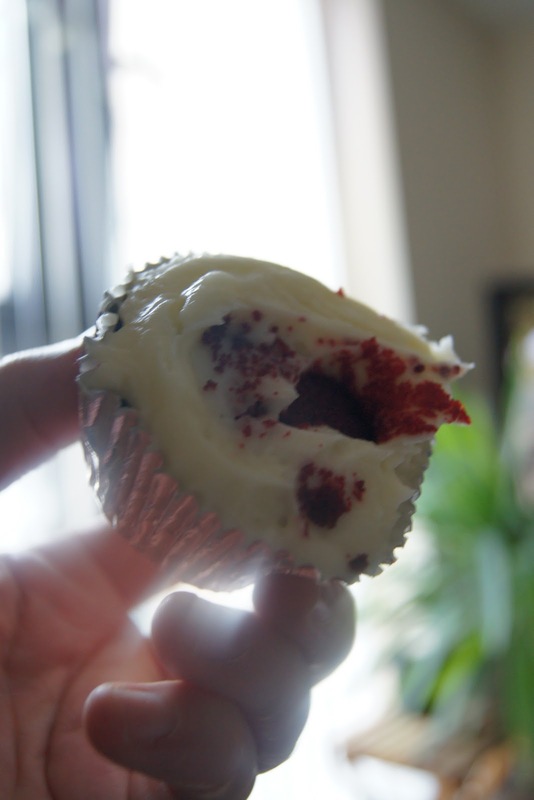 They couldn't guarantee that the red velvet cupcake with butter cream icing was gluten-free since it was made in a kitchen where wheat flour was used, but the girl assured me they'd taken good care to make sure it wasn't contaminated with gluten. Now, the question is, was this tiny bit of goodness--it really was very small--worth 3 pounds? No. Even in its cute little box? No. Rule no. 1: do NOT eat fish and chips in London. Rule no.2: do NOT eat at Leicester Square. But, I guess you have found that out for yourself. Ha. True. I only went to try the gluten-free fish and chips because this restaurant is the only one I've heard of that offers it. When I'm in London I almost never go into central London. I'm having trouble reading comments due to excessive whiteness. And man, you need to settle on a blog design. I like this one. Laura has been following a gluten-fee diet recently, thinks she might need to eat gluten-free. We won't check in to the Mermaid's'. For awhile I was on a gluten-free diet (no longer, thank gawd) and it was very difficult to eat out... so I understand why you had to try the Mermaid(')s Tail fish and chips. Sorry it was awful - what a letdown after 6 years. Expensive!! I enjoy central London for the bustle but eating well there isn't easy. Sorry you had a bit of a culinary disappointment -- especially at those prices! I hope that a more satisfying gluten-free fish and chips opportunity will come your way soon.